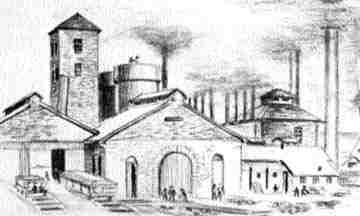 The East Penn Furnace, helped supply materials for Pennsylvania railroads, was built in 1869 by the Hunter Family. In about 1888 William Bieber of Bieber Roller Mills owned a piece of land which consisted of about 10 to 15 acres along the railroad tracks between Lyons and Bowers. The Hunter family of Sally Ann Furnace needed another outlet for their charcoal business. This property on the south side of the railroad interested the Hunters for the establishment of an iron furnace. Large deposits of stone and clay were located above Bowers. Deposits were also found between Bowers and Sally Ann Furnace. Another deposit of the same was in Rockland Township; also a good supply of wood. The railroad would be a source of transportation for the finished products. Mostly German immigrant bricklayers, carpenters and furnace operators built the furnace in 1869. By 1871 the furnace was in full operation. Many working people were needed to operate the wagons, handle the horses, work the stone quarry, clay pits and haul it all to the furnace site as far as three or four miles. An estimated 30 to 40 people worked to keep the operation going. The street leading to the furnace was named Hunter Street in favor of the Hunter family of Sally Ann Furnace. The first officers of the company were: Julius Schdasher, President; Benjamin Helfrick, Secretary/Treasurer. Other members and stockholders were: George Nicholas, Henry Hunter, George Rohrbach, George Dasbach, John Sabler, Jona Youse, Paul Kuscher and H.W. Garret. In 1873 there were few homes in Lyons to house the furnace workers. It was decided to build houses. The population that year was 75. A railroad siding was added for easy transportation of iron ingots and and coal to be used as coke to fire the furnace. In the summer of 1886 a heavy wind storm took down the tower and furnace chimney. They were never rebuilt. The machine shop which was used to repair picks and shovels was operating for an additional year and a half. In 1890 the operation was not prospering and the bricks from the building were sold, as well as the property between Lyons and the furnace. Isaac Merkel and the Grimm family purchased approximately five acres. The houses were sold to business people in the town for $100 per home. The first two double homes were sold to Amos Rapp of the Rapp and Bieber Roller Mills. The next home, on the corner of Hunter and Stoltz Street was sold to Paul Luckenbill, a butcher. The last two houses were sold to John G. Haring, the father of Wallace and Chester Haring. The open alley land was sold to Lyons resident Cosmos Kutz and James DeLong. In the 1920's, Thomas Reppert purchased this land and built his house along with a smaller house in which his mother resided. (the small house in no longer there) In 1900, Comos Kutz bought the five acres where the furnace stood. In 1902, Mr. Kutz sold half of his interest in the land to his brother-in-law, James DeLong. Mr. DeLong paid $450 in full on May 1, 1902. Throughout the years, many families have lived in these homes. The furnace property is still owned by the descendents of the DeLong family. Items to note: All the machinery in the furnace was operated by steam. The creek between the railroad and the furnace did not provide enough water, so a well had to be drilled. In 1934, cinder bricks were removed to be used in the construction of roads, which did not work properly due to the high content of sulfur.